Irrespective of whether you are a troubled sleeper, or just need a bit of help relaxing before bedtime, some gentle yoga postures at bed time can help you in gaining a good night’s sleep with ease. These postures, will keep your body and mind at rest, thereby helping you sleep soundly through the night, so that you wake up feeling more refreshed in the morning. Various studies have proven the benefits of yoga in reducing insomnia. A 2012 study which evaluated the effect of yoga on post-menopausal women with insomnia revealed that the reduction in severity of insomnia was considerably higher in the yoga group, than that in the control and passive-stretching groups. The study showed that a particular yoga sequence may be effective in reducing insomnia and menopausal symptoms, apart from improving the quality of life in post-menopausal women with insomnia. If you are unable to get a good night’s sleep on a regular basis, you may be aging faster than you think, as when we sleep, our body repairs on a cellular level and removes toxins. Therefore, at least six to eight hours of sleep daily is a must. If you are unable to sleep enough, yoga can be of help. It has been proven that regular yoga practice cures various ailments including sleep disorders and insomnia. In fact, yoga helps unwind stress at the end of the day, so that you sleep better at night. An often-recommended treatment for insomnia is to establish a relaxing bedtime routine and practice some of the yoga stretches recommended below so that you can relax and enjoy a peaceful sleep. Hastapadasana (forward bend): This posture helps stretch the back muscles, makes spine flexible and supple, and invigorates the nervous system, helping you to sleep well. Marjariasana (Cat stretch) – Excellent for spine flexibility, massages the digestive organs, improves blood circulation and relaxes the mind, thereby helping you to sleep well. Shishuasana (Child pose) – Gives a deeply relaxing stretch for the back, which also helps calm the nervous system, so that you get a peaceful sleep. Baddha Konasana (Butterfly Pose) – Stretches inner thighs, groin and knees, helps remove tiredness from long hours of standing/walking. Shavasana (Corpse Pose) – Apart from lying down in Shavasana and Yoga Nidra after meals, it helps relax the entire system. Advasana (opposite of Shavasana) – This posture is opposite of Shavasana. It is particularly beneficial for those with spine or spine-related disorders like slipped disc etc., and induces sleep. Meditation – Once you get on to bed, sit in a cross-legged position, lean back slightly onto your pillows or headboard, close your eyes, rest your hands on your thighs, stay there and breathe for a few minutes. This need not be a heavy and intense meditation, but just a short unwinding technique. Mentioned above are only some particular yoga postures that may be of help in improving your sleep pattern. Out of these, you can choose the ones suitable for you. On completing the session, relax and enjoy a good night’s rest. Avoid watching television, working on laptop and looking onto screens one hour before bedtime. Instead, unwind listening to soft instrumental music, or read a book. Follow a definite bed time routine, like taking a warm shower, doing yoga and meditation, prayer and go to sleep with a happy, relaxed mind. Maintain at least a gap of two hours between your dinner and sleep. 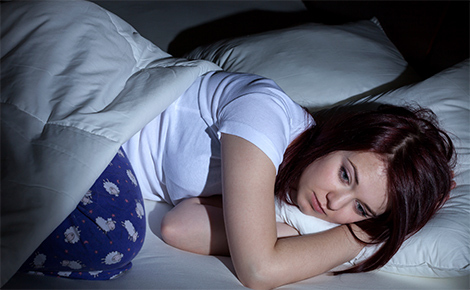 Do not take any stimulants at night, and also do not go to bed with a disturbed or tensed mind, as it is bound to disturb your sleep and will also disrupt your next day schedule. Avoid napping during the day. If you should, ensure that you do not sleep for more than half an hour during the day. If you practice yoga, avoid doing Bhastrika pranayama and Sudarshan kriya in late evenings, as you will be filled with energy and this will prevent you from falling asleep.